Getting the most out of your ergonomic equipment may mean working one on one with an Ergonomic professional to provide the extra insight you want to improve your workplace. In our current Self-Service world, there are numerous software programs to walk you through setting up your computer workstation. But consulting an ergonomic expert to provide on-site ergonomic assessments and evaluations of your worksite has multiple benefits. An on-site workstation assessment can help in the reconfiguration of the workstation based on users’ tasks. 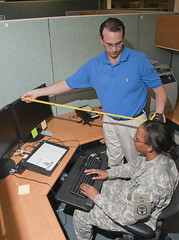 Trained ergonomic professionals can demonstrate how to properly use and adjust equipment; demonstrate proper postures for various tasks while employees get supervised practice using proper techniques on the job tailored to their individual needs. During the assessment, areas that still pose a threat can be addressed with optimal, cost-effective solutions recommendations. Sometimes all that is necessary is re-positioning existing equipment to comply with ergonomic standards. When you have a one-on-one experience with an ergonomic professional, you receive specific care to your individual questions in your current environment rather than a “one-size-fits-all” approach. Human bodies, work comfort levels and proper positioning all depend on the individual, something this sort of approach is unable to assess. Sometimes employees need immediate feedback to master new interventions and create new work habits. It is difficult to remotely assess the true working conditions like lighting and layout where several needs have to be factored in; whether using natural light versus task or overhead lighting depends on the job activities. As we all know, an ergonomically designed floor plan can improve not only the safety but productivity in the workplace. Bringing in a trained ergonomic specialist adds a human dimension to the workplace and shows employees their health and productivity is a top priority, improving morale and encouraging employees to take control of their comfort during the work day to have better balance in their lives. At Sierra, we provide individual workstation assessments, evaluations and reviews. Even if you have been trained in the past, you may have moved to a new workstation, or obtained new technology or needed to update your technology in order to be most productive and minimize repetitive work related injuries. We can evaluate the entire work area to evaluate lighting, layout and safety. We also evaluate individually to ensure everyone understands and uses sound ergonomic measures in the workspace. We can reinforce your current ergonomic program. Contact us if you would like to know more about how we can assist you with your current office. Contact us at (949) 720-3996.